Justice League is a weird conglomeration of a movie. Assembled from two very different directors’ styles, it features actors who attempt hefty dramatic work within a cobbled and repeatedly shredded script. It is dumbfounding how much fun the film conjures up in its 120-minute runtime. From Aquaman surfing a baddie into an apartment building, to Wonder Woman saving hostages from a desperate situation, the film has no shortage of jaw-dropping character moments. They almost redeem the rest of the film’s lost ambition, but make its failures all the more difficult to take. 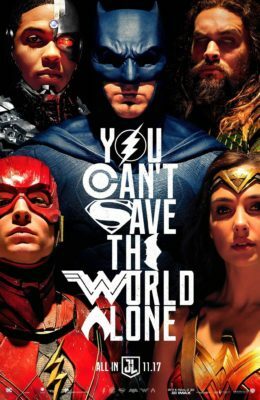 Co-directed by DC bad boy Zack Snyder and with help from Marvel’s Avengers director Joss Whedon, Justice League attempts to replicate the same grandeur of other team-up films without the long line of set-up films other franchises offered their viewers. While the lexicon of DC’s biggest characters have become more mainstream in the past few years, the reintroduction of these characters seems rushed. Justice League presents a world seemingly removed from the gothic dread of Batman v Superman’s landscape and attempts to match the vibrancy of Wonder Woman’s greatest moments, but instead creates an amalgamation of ideas without a central core that brings everything together. The limbo this film’s tone exists in is seemingly born from the addition of Whedon’s penchant for humour being added to the bones of what could have been another heavy handed Snyder interpretation of the kid-friendly animated series Batman and Friends. The mix of styles doesn’t really work, yet the humour is no doubt one of the greatest qualities the film presents. Ezra Miller in his portrayal of the Flash is hilarious in his childlike, fumbling approach to battle. Jason Momoa as Aquaman is sure to win over those audience members apprehensive about this Atlantean’s fish-talking past. There is no doubt that Gal Gadot is the greatest DC Snyder could have added to its fledgling franchise. Wonder Woman anchors the film with a strong and hopeful emotional arc so that it truly becomes a joy to watch her as “hard hitting and strong” in a way other characters could only wish for. The heftiest criticism of the film comes from its overall undercooked feeling. From a script that makes less sense with more thought once again provides a Bruce Wayne that is both a nerd and an intense jerk. The storyline screams of needing more work, and with the addition of major scenes later in production, the CGI of the film goes from decent to unacceptable in single scenes that unfortunately would have been better if the entire production and release had been pushed a ways into next year. As it was released, however, there’s no justice for these characters.